Originally posted on My Weekly Preview issue 449. Little Mountain artist and author Peter Rowe is one of 200 artists exhibiting at the 37th Immanuel Arts Festival. His story of triumph over adversity through art has won hearts and captured the attention of art critics and galleries around the country. Paints, paintbrushes and canvases cover every available space in Peter Rowe’s art studio, a large shed behind his parents’ home in Little Mountain. We sit at a paint-splattered table while his finger taps away on a piece of cardboard printed with letters, and his facilitator Tracey Wiggins, who helps hold his hand steady, translates Peter’s thoughts: “This is my happy place”. Rowe is an articulate man with a great sense of humour, a big smile and an inner joy that radiates from his colourful work. 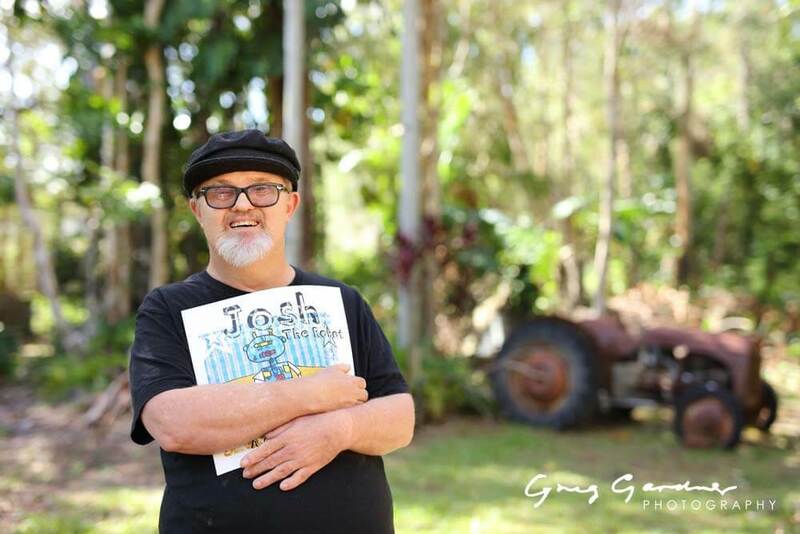 He has survived a traumatic past to become a successful artist, author and inspiring public speaker who is passionate about spreading a message of acceptance and inclusion. 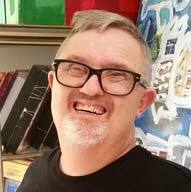 Rowe was born in 1964 with Down syndrome and could barely communicate for the first 30 years of his life. He is non-verbal due to muscle tone and movement restrictions associated with his disability and in 1994, his life changed dramatically when he discovered facilitated communication (FC), which allows him to spell words on a cardboard keyboard, or QWERTY board, while a facilitator translates. It was through FC that he was able to tell his mother he was being physically and sexually abused in a care facility he lived in during 1999 to 2001. He began art therapy as a way to heal his post-traumatic stress disorder and today, he works with an art tutor, Cheryl Nonmus, who encourages him to push the boundaries with his art, which is mostly abstract and draws on deep emotions. He also plays golf and travels Queensland and interstate for exhibitions and public speaking engagements. In 2012 he was on a panel discussion with Jessica Watson on overcoming hurdles, and in 2013 he gave a presentation at Macquarie University in Sydney, among many other engagements. This form of communication saved my life,” he says. “When I was introduced to FC my life changed dramatically. I went from being a man with so much to share but no way to do it, to be able to tell the world, hello, Peter Rowe is here. On a bigger note, it also allowed me to tell my mum I loved her for the first time. We cried and cried and cried, but they were tears of joy and happiness. I was also able to tell my mum and dad that I had been through some very bad experiences in the care I was in. It was both a very happy and sad time when I was introduced to facilitated communication. I was then freed to share all the stories in my head and it was amazing. My parents are the strongest support advocates in my life. They were told for the duration of my life I had an intellectual disability and no understanding. They were pretty much told just give him a nice life. Well, I have shown them haven’t I? I had stories in my head and I used to do puppet shows for the family but after FC my world changed. It really did save my life. I went on to start art therapy as a way to assist with past trauma. This saw me work through the dark times and use dark colours. Now I am living a life that is full of colour and laughter and love and my art expresses that. Rowe’s Take a Seat exhibition featured at Gympie Regional Gallery followed by Gladstone Regional Gallery in late 2016 and a selection from the exhibition will be on display at Hervey Bay Regional Gallery from September 8 to October 15. Closer to home, he is exhibiting in the upcoming 37th Immanuel Arts Festival, where he’s been an emerging artist steadily gaining notoriety over a number of years. This year he’s entering his first pieces of sculpture, along with paintings and mixed media works. Like the paintings in his Take a Seat exhibition, his new sculptural pieces will use chairs as a metaphor for the supports he has received in his life from family and community. All the pieces tell a story and have a piece of me in them,” he says. “They are a reflection of who I am. I’m many things. I am an author, an artist, a golfer, a public speaker and I just happen to have Down syndrome. 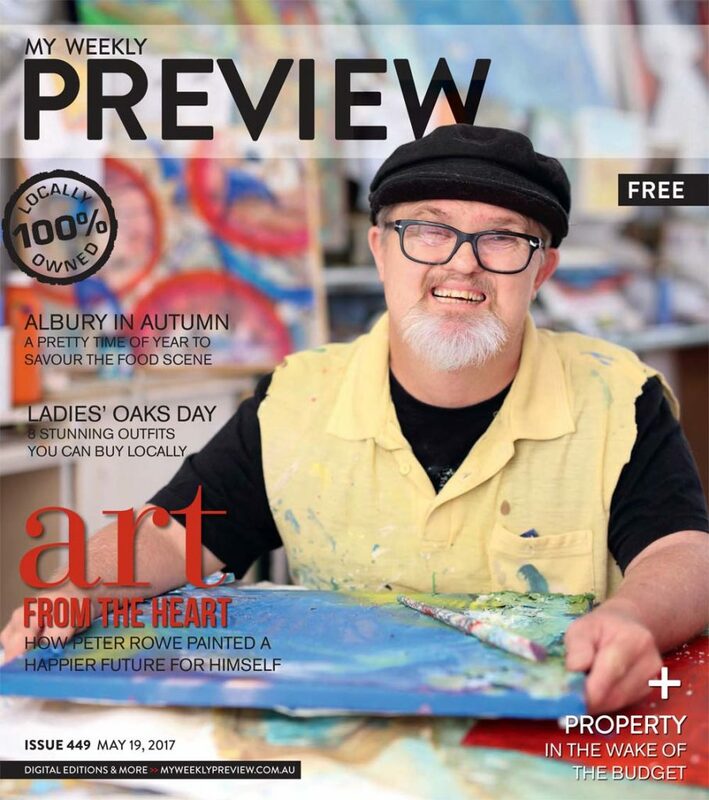 I am not Down syndrome and my art allows me to share the playful and creative side of myself. Festivals such as Immanuel Arts Festival are important because they give everyone a platform to shine,” he says. “I feel it is very important that we all take responsibility to ensure that our communities are inclusive. It’s not about disabilities, it’s bigger than that. It’s about taking care of each other and creating opportunities for people to show what they have to offer. Being connected and part of your community assists with making sure people do not become isolated or marginalised, and this is so important to me. 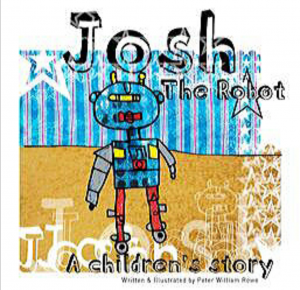 Among Rowe’s best work is a series of children’s books he wrote and illustrated about a character called Josh the Robot, who is teased and excluded by the other toys because he’s different, causing him to “cry oily tears”. “I love robots – my earlier art was full of them. Cheryl, I’m quite certain, is glad we have moved on from my robot phase,” he laughs. “That is why Cheryl is so valued to me. She challenges my artistic abilities. “I am always looking for new ways to explore my creativity. Who knows where it will take me? But I know I will always be doing art, as it has assisted me to work through the tough times and it is a great love of mine. How very exciting that I don’t know where it will take me – like a big present you are yet to unwrap. “There are big things coming. The Peter Rowe show is about to really take charge and lift off from the foundations that the many people in my life have assisted and supported me to create. 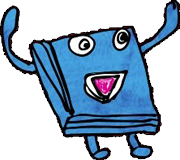 I have my books, my art and I am truly passionate about getting more public speaking engagements to help continue to change social perceptions. There are lots of things in the works and I have many people to thank both past and present, as they all help me to achieve my dreams and goals. I want to say that together we are capable of so very much and that when we look beyond labels and see the person, we also see what we are all capable of and that we have more in common than we think. Lastly, I want to encourage everyone to find a creative outlet. Whether that is art, or writing, or singing in the shower. It is good for the soul.